Jen Del Muro from I Heart 2 Stamp made the cutest card ever! You have to check out her blog, it is filled with wonderful projects and ideas. Be sure to scroll down and see her Put a Pin on It post. 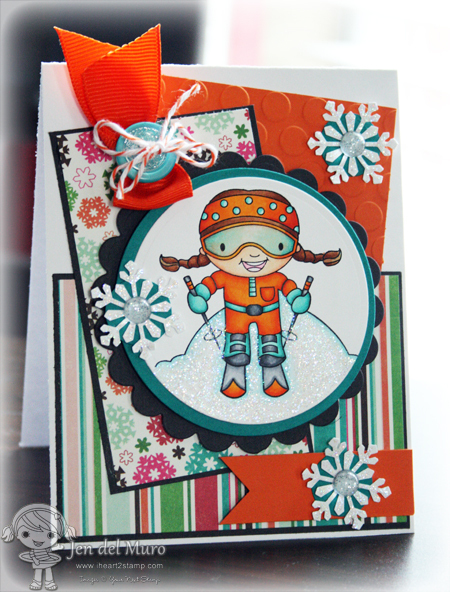 To make her amazing pin, Jen used this Fringe Flower die from Lil’ Inker Designs. I think this is going to continue to be a hot trend! Click here to see another card made with this fun die and here for a tutorial on how to make the flowers. I love the Creative Critterz Imaginations blog! You just have to check out Yvonne’s post on how to print on tissue paper using the Imagine. I can’t wait to try printing on tissue paper. Wow!! Charity from Meaningful Menagerie designed these elegant and simple cards for the Cricut blog! She is an amazing designer and her blog is beautiful! A couple of weeks ago, I made a two- part video series on glue guns. In part two, I made quick and easy embellishments using colored glue sticks. After finishing the video, I discovered a site that carries beautiful metallic and pearl glue sticks and other unique items including wax seal stamps. Check out Nostalgic Impressions and click here to see their glue sticks! Gorgeous! I have another secret…shh. Click here for the news… I am soo excited and there is more to come! Thanks for stopping by and I hope you are having a fun filled Friday! Congrats on your new design team gig, Linda! That is so exciting!!! Congrats on your new DT gig,I can hardly wait to view all the great work from you gals. So fun!! Congrats Linda! I am so happy for you! Adorable card and the coloring is fantastic!! Congrats Linda!! Thank you for the sealing wax link... how did you know I was looking...? Congrats on the design team!